Residents of the City of Hartford will be voting on November 5, 2019 to elect a Mayor, Treasurer, and 9 members of the City Council. The Hartford Citizen will attempt to document who is running within the City. The baseline assumption is that all the current officeholders will run for re-election. Candidates will be tracked on the Election 2019 page. The link associated with a candidate points to their campaign website. If a candidate drops out of a race, or switches races, then their name will be crossed off (but not removed). City of Hartford Treasurer Adam Cloud is scheduled to meet with the Council’s Operations, Management, Budget, and Government Accountability Committee on the evening of Monday, May 2, 2016. The Office of the Treasurer acts as a co-issuer of the City’s debt and as the investor of the pension fund. Both the debt and the pension contributions have been cited as contributing factors to Hartford’s structural budget deficit. As City leaders work to restructure Hartford’s finances, both closing this year’s budget gap and putting the City on a more sustainable long-term path, difficult questions need to be asked. Nothing should be exempt from scrutiny. The Treasurer’s appearance at the Committee meeting is a rare opportunity for the community, via its Council members, to ask important questions of the Treasurer. Treasurer Cloud, you have appeared before previous Councils to advocate for numerous general obligation bond sales. Some sales have been new debt to fund capital projects, while others have been restructurings of the existing debt. We’re now being told that the City has too much general obligation debt, and that the worst is yet to come in terms of repayment. Do you believe Hartford has too much general obligation debt? If yes, why haven’t you sounded the alarm in the same way that you have about potential decreases in pension contributions? If no, what metrics do you use to gauge the appropriate level of debt? What do you recommend Hartford do with respect to managing the debt? The Fourth Quarter 2015 Investment Performance Analysis report for the Municipal Employees’ Retirement Fund (MERF) stated that investment performance has been very poor over the past 5 years. 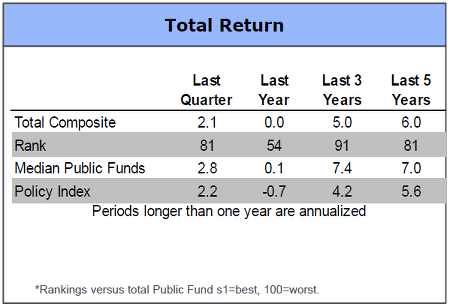 The MERF’s total return was worse than 80% of the other public funds in the benchmark. Specifically, the MERF’s return is reported as 1% behind the median fund over 5 years. The underperformance has cost the MERF an estimated $10 million per year (1% of a $1 billion fund), or $50 million over five years. Why is the MERF ranked near the bottom of Public Funds for long term investment returns? What have you done, and what are you planning to do, to improve performance? Investment returns on the assets in the City’s pension fund have been well below average for the past five years. Poor investment performance impacts the General Fund in two ways. First, the General Fund will need to make extra contributions to the MERF because of the poor investment performance. The General Fund is a main source of cash inflows for the program. Since Hartford’s pension investments didn’t grow as much as those of other pension funds, the taxpayers have to provide additional support. Second, poor investment performance diverts scarce resources from the other General Fund priorities. Pension contributions are a top priority. The extra contributions that result from the MERF’s poor investment performance mean that other programs and services need to be cut even further to bring the budget into balance. Pension contributions are one of the larger line items in the General Fund budget. The table below comes from page 28-1 of the Mayor’s Recommended Budget. 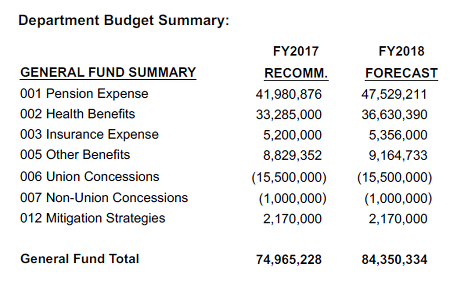 The recommended budget calls for just under $42 million in pension contributions this year, and over $47 million in contributions next year. It also calls for $16.5 million in employee concessions. The table is full of large numbers. It might look a little different if the assets of the pension fund produced investment returns that matched, or exceeded, its peers. $50 million in estimated MERF underperformance matters. The Municipal Employees’ Retirement Fund (MERF) is a $972 million investment portfolio that pays the pension benefits of retired City employees. The investment performance of the MERF has been poor in recent years. The poor performance is costing the City money, and contributing to the structural budget deficit. The Fourth Quarter 2015 Investment Performance Analysis report, on the City Treasurer’s website, ranked the fund’s total return over different time periods. The following chart was taken from the “Investment Summary” on page 16. It reported that over the past 5 years the fund was in the 81st percentile, which meant that 4 out of 5 Public Funds did better than the MERF. Over the last 3 years the fund was in the 91st percentile, so 9 out of 10 Public Funds did better than the MERF. Underperformance in the short term is understandable. Markets fluctuate, and the MERF does not attempt to mimic the market. However, five years of very poor returns suggests there is something wrong with the MERF’s investment strategy. It’s difficult to know exactly how much the poor investment performance has cost the MERF. It’s about a $1 billion fund, so 1% of underperformance for 1 year would result in about $10 million in missed opportunity. The chart above states that underperformance has been 1% per year for five years. That suggests the MERF’s assets are about $50 million lower than if the fund performed at the median Public Fund level. Going a step further, if Hartford had an above average investment strategy, then MERF assets would be even more than $50 million higher than they are right now. The investment strategy of the MERF has cost the fund tens of millions of dollars. This missed opportunity, in turn, will result in extra contributions from outside the fund. Hartford’s leaders passed a balanced budget for fiscal 2016. Regardless of the exact figure, three primary strategies were used to bridge the majority of the $40+ million gap. First, “sustainable department cuts” were made that saved $12.8 million. The description that accompanied the dollar figure noted that there would be no cuts in “essential” services. The savings came via increased efficiency and, by implication, cuts to unnamed non-essential services. Finally, the City negotiated a deal with the Schools to spend $13 million that had been set aside by the Board of Education. The details of the agreement are not posted on the City’s website with the adopted budget. However, media reports have stated that in exchange for spending the $13 million, the City took on $11 million of school expenses in the capital improvement budget. This year’s strategies did not include any efforts to address the structural nature of the budget gap. Instead, the three primary strategies responsible for balancing the 2016 budget are likely to make the structural budget deficit worse in future years. A recent police staffing report stated that the department is significantly understaffed. The police department is one of the “essential” public safety functions, raising immediate questions about whether department cuts are “sustainable.” The City has begun adding staff to backfill cuts made in this, and previous, budget cycles. Restructuring the debt to reduce payments in fiscal 2016 and fiscal 2017 increased the payments in the future. Over the next two years Hartford is scheduled to pay off $2.24 million of the $424.9 million the City currently owes. The total owed will increase in coming years. The 2016 – 2020 Capital Improvement Plan that was approved in conjunction with the 2016 budget calls for over $378 million in net borrowing over the plan’s five year life (see page 17). If media reports about the deal with the Schools to spend money earmarked for post employment benefits are accurate, then effect is two-fold. Taking the $13 million reduced the funding status of the Schools’ benefits program. The $11 million in future debt/payments the City accepted from the Schools repays some value, but doesn’t make the Schools whole. The Schools still have to rebuild the account balance, and they lose out on all the potential investment income that the $13 million would have generated. On the City side, the $11 million the City added to the Capital Improvement Plan in exchange for access to the $13 million represents additional future costs too. The practical result was that the City borrowed $13 million to spend on this year’s operating expenses, and will repay it over time. One could argue that getting $13 million and repaying $11 million over time is a good deal. For some people, companies, or municipalities, a negative interest rate loan like that would be a good deal (it’s an arbitrage opportunity). For others, those that repeatedly restructure their debt to postpone repayment, borrowing to meet current operating expenses has a negative overall impact. It increased Hartford’s debt burden and decreased Hartford’s financial flexibility. All three of the primary budget “balancing” strategies involved manipulating expenses to make the 2016 income, expenses, and cash flow work. None of the three strategies will help put Hartford on a more sustainable financial path, and each one is much more likely to make the structural budget gap worse. The City of Hartford began the 2015-2016 fiscal year with a $78.06 million debt issue intended to help balance the current year budget by deferring payments. 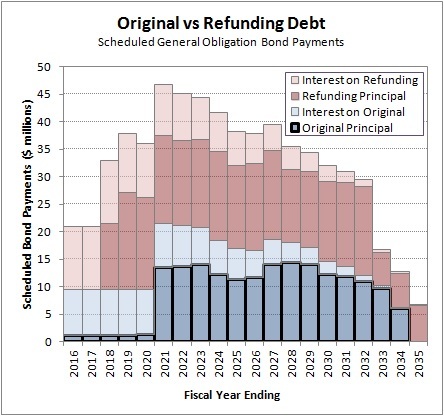 The chart below compares the scheduled debt payments before and after the restructuring. The City’s projected debt profile as of June 30, 2015 is shown in the rear in green. On top of that series, the purple bars show the City’s new debt profile after the restructuring. The primary goal of the restructuring was to dramatically lower debt service payments in fiscal 2016 and 2017. The Hartford Citizen model shows cash savings of over $15 million and $16 million for the two years, respectively. Cash savings are projected to be more modest in fiscal 2018 – 2020. Again, the green tops on the bars represent savings. In exchange for reducing the near-term debt service, the City took on additional payments of between $4 million and $6 million in each year from 2021 through 2034. Those are the bars with purple tops in the chart. The change to 2035 was negligible, and no debt was added for fiscal 2036. 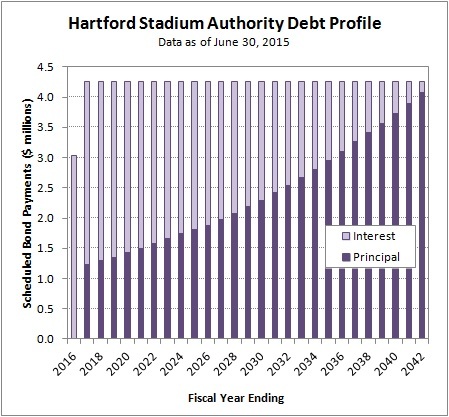 Note that the Hartford Stadium Authority’s debt has not been included in this calculation. The Stadium Authority is structured as a financial pass-through, where the City makes lease payments that exactly match the Authority’s debt payments. The City will be required to pay an additional $4.26 million per year in lease payments from 2017 through 2042. 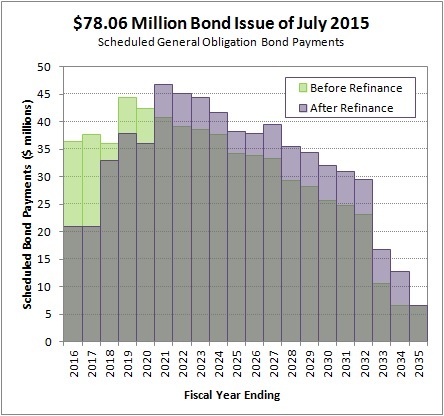 $20.8 million of the $78 million in debt raised in July 2015 was issued as taxable bonds. When asked why the bonds didn’t qualify for tax-exempt status, City Treasurer Adam Cloud stated that IRS tax law only allows tax-exempt bonds to be refinanced one time with tax-exempt bonds. Further refinancings are required to be done with taxable debt. The July 2015 debt restructuring provided the City of Hartford financial relief in fiscal 2016 and fiscal 2017. At the same time, it continued a recent trend of postponing debt, and highlighted an additional cost for future restructuring efforts. In October 2014, the Hartford City Council approved the construction of a minor league baseball stadium as part of the Downtown North redevelopment project. The Hartford Stadium Authority was created in January 2015 to oversee the facility, and was empowered to issue debt. The Hartford Stadium Authority raised $63.4 million via two bond issues in February 2015 to fund construction. Taken together, the debt was structured to be repaid in annual installments of about $4.26 million until the City’s fiscal year that ends in June 2042. The debt is backed by a lease that the City of Hartford signed with the Stadium Authority. Scheduled rent payments, as shown in page 12 of the Official Statement, are intended to match up exactly with debt payments. Two series of bonds were issued to fund construction because a portion of the costs did not qualify for the tax-exempt status that municipal governments usually receive. 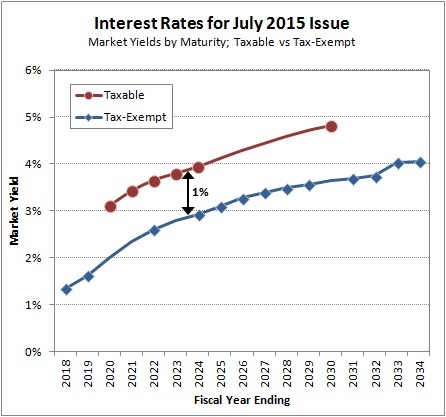 Tax-exempt bonds totaled $39.1 million in face value, and were issued at yields of between 1.23% and 4.15%. The remaining $23.4 million in face value was determined to be subject to federal taxes, and was issued at a yield of 5.625%. When asked why a portion of the debt was issued as taxable, City Treasurer Adam Cloud explained that the public infrastructure created during stadium construction is tax-exempt. However certain things, like luxury boxes/suites, are private use and are required to be financed on a taxable basis. Debt service on the stadium is structured as a fully amortizing loan. The City, via the Stadium Authority, will make equal payments every year until the construction costs have been repaid. Although the underlying bonds have a wide range of maturities and yields, the overall strategy is directly comparable to how individuals finance residential real estate purchases. Converted to the terms of a fixed rate mortgage, the City borrowed $62.45 million, using a 27 year loan, with an interest rate of 5.0%. It’s budget season in Hartford, and both the Schools and the City have released their proposed budgets. Dr. Schiavino-Narvaez, Superintendent of the Hartford Public Schools, released her proposed budget on April 7, 2015 showing $429 million in revenue. Pedro Segarra, Mayor of the City of Hartford, released his proposed budget on April 20, 2015 showing $534 million in revenue. Although the two proposed budgets are separate, they overlap. The chart below shows the revenue sources that are included in each proposal. The total combined revenue is $679 million once the double counting is eliminated. $429 million is to be spent on the school system, while $250 million is to be spent on non-education programs. Also of note is that over 76% of the proposed funding for the school system comes from State and Federal grants. Hartford’s financial condition has gotten to the point where it cannot be fixed in a single budget cycle. Breaking the process into phases will give the City a better chance at success. Restructuring will require collaboration between all stakeholders; the Administration, the City Treasurer, the City Council, City employees, the State, the business community, the non-profit community, and the residents. Presumably there are others that have been left off this list; they should be included too. It is not a process than can, or should, be handled quietly in back rooms and then presented in final form. Once the community commits to making difficult changes, the first step will be to develop goals and a strategy. All stakeholders need to be involved in the conversation. There must be an extensive public discussion. Practical concerns seem most pressing. 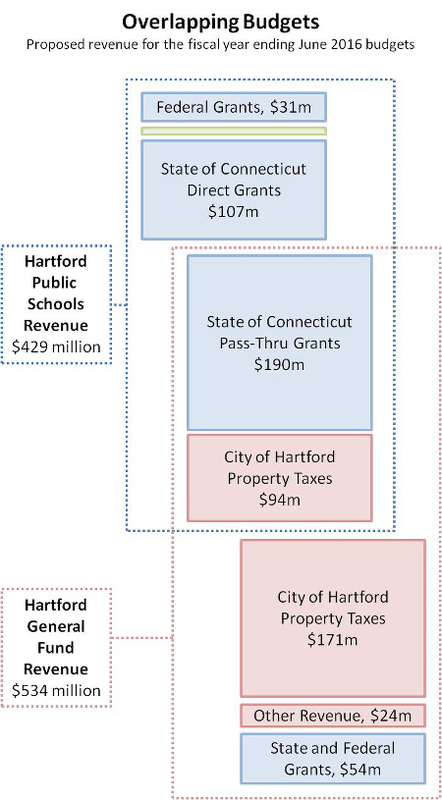 Can Hartford find a balance between revenue, operating expenses, and long-term liabilities? Philosophical concerns are also important, given the City’s limited resources. How much should the municipal government try to accomplish? How should municipal objectives be prioritized? Reducing expenses first is more conservative than trying to do everything at once. Even the most well thought out plans involve estimates. The City needs to know how effective the expense reduction initiatives will actually be before adjusting the revenues. It could take years to fully implement the expense reduction ideas, as agreements will likely need to be negotiated with the employee unions. Reducing expenses first will also allow the City to operate at a surplus for one or more years. The extra funds will not be needed for operations, so they can be used to pay down the bonded debt, improve the pension plan’s funding level, or fund an account for Other Post Retirement Benefits. Once City operations have been reorganized, the revenue can safely be adjusted. In practical terms this means dealing with the split tax rate so that the mill rate can come down. Hartford’s current strategy of hoping that the financial stress resolves itself has failed. A new strategy is required, and it will take years to identify and implement the necessary changes. The first step is starting the conversation. Stakeholders need to identify their goals and priorities for the municipal government. Ultimately, Hartford needs as much input as possible, from everyone who has a stake in the community.